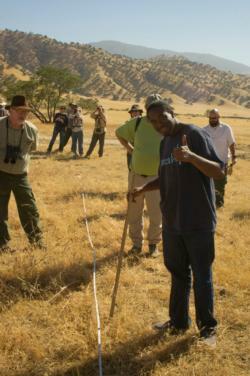 Tejon Ranch Conservancy California Naturalists learn how to monitor plant communities. This is the goal of fostering environmental stewardship in our communities. To change the way we view natural systems, to use science to inform our decisions at home and at work, and to foster an attitude of personal responsibility to care for the natural world. California Naturalists will explore the interconnectedness of all things in our environment from the air we breathe to the water we drink and use to grow the food we eat. The naturalist will begin to see how our actions impact the resources which comprise the majestic diversity of our state, including the water, wildlife, and plants. This program takes a look at the complex issue: how do we support our human population without destroying the natural landscapes we depend upon? The answer undoubtedly involves taking action, whether this is changing your daily routine a bit and riding a bike to work, shopping at a farmers market, volunteering to do stream restoration or air quality monitoring in your community or teaching others on nature walks, all of us can find new ways to be good stewards of our natural world.